Drawing on the report he co-authored for the Wales Centre for Public Policy, The Welsh Tax Base: Risks and Opportunities after Fiscal Devolution, Guto Ifan of the Wales Governance Centre explores the income tax base in Wales. From next April, the income tax paid by Welsh taxpayers will be partially devolved to the Welsh Government. UK government income tax rates paid in Wales will fall by 10p in the pound (e.g. from 20p to 10p at the basic rate). In an historic landmark for devolution this autumn, the Welsh Government will introduce its own rates in each tax band, and revenues from these rates will form a part of its 2019-20 budget. Setting a 10p rate in each band (i.e. keeping tax rates paid by Welsh taxpayers unchanged) would raise around £2,099 million for the Welsh Government in 2019-20, while the HM Treasury will make a corresponding adjustment to the Welsh block grant to account for their loss of revenue. This blog piece analyses the composition of the Welsh income tax base using HMRC taxpayer survey data. It highlights the significant differences in the Welsh tax base compared with the rest of the UK (rUK), with implications for tax policy and risks to future Welsh budgets. The non-savings and non-dividend (NS-ND) income tax base being devolved can be disaggregated into income from employment, pension income, and a small amount from other income sources, such as property income. Welsh taxpayers earned an estimated £33.4 billion of NS-ND income in 2014-15, of which 78% was derived from employment income. The largest share of this came from private sector employment income, though public sector employment income accounted for a much larger share of the Welsh tax base compared with the rUK. Pension incomes also accounted for a larger share of the Welsh tax base (20%) than the rUK (15.3%), mostly a reflection of Wales’ older population. The composition of private sector taxpayer income by industry also varies considerably between Wales and the rUK. 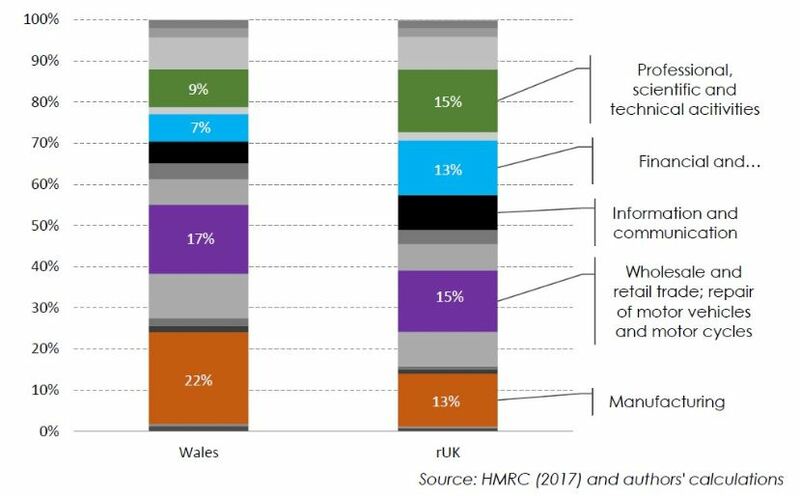 As illustrated in figure 2, taxpayers employed in manufacturing industries account for the largest share of private sector employment income in Wales (22% – compared with 13% in the rUK), followed by wholesale and retail trade (17%) and construction (11%). In the rUK, a much greater share of private sector employment income derives from professional, scientific and technical activities (15%) and financial and insurance activities (13%). Perhaps the biggest difference between the Welsh tax base and the rUK is in the distribution of taxpayer incomes. Although the difference in the median taxpayer income is relatively small – £20,100 in Wales versus £21,100 in the rUK – it is at the upper end of the income distribution that differences between Welsh and rUK taxpayer incomes become apparent. Taxpayer income at the 90th percentile in Wales in 2014-15 was £41,200, compared with £48,900 in the rUK. The Welsh “one per cent” also earn significantly less; taxpayer (NS-ND) income at the 99th percentile in Wales was £94,600, while rUK earners needed to earn £153,400 to be in the top one per cent of taxpayers. A relatively large proportion of the rUK tax base is derived from the incomes of high earners. In 2014-15, the top one per cent of taxpayers alone earned 12.3% of total NS-ND income (compared with 6.4% in Wales). Although less dependent on those on very high incomes than the rUK, the Welsh tax base will also be heavily influenced by the income of the highest earners. As shown in figure 3, after subtracting personal allowances and reliefs, and assuming the Welsh Government sets a 10p rate in all bands, the top one per cent of taxpayers will contribute more to devolved revenues than the lowest-earning 40% of taxpayers, and the top 10 per cent more than the lowest-earning 70%. The distribution of incomes across taxpayers has implications for Welsh Government tax policy as it considers setting income tax rates for the first time in this Autumn’s budget. 86% of devolved tax revenues will be raised at the basic rate (compared with only 70% across the rUK). This means that any tax increase to raise significant additional revenue for the Welsh budget will have to include increases in the basic rate. Meanwhile, the cost of cutting the higher and additional rates will be relatively lower. But most importantly, these highlighted differences between the Welsh and rUK tax bases could have an impact on the size of future Welsh budgets. The adjustment to the block grant made by HM Treasury to account for income tax devolution will vary from year to year according to what happens to revenues in the rest of the UK. In short, different trends in the tax base in Wales compared with the rUK will affect the Welsh budget – faster growth in Welsh revenues will boost the budget, while slower growth will create a shortfall. Taxpayer incomes in Wales, especially at the upper end of the income distribution, will need to keep pace with those in the rest of the UK. Furthermore, if economic shocks affect certain industries in the UK (for example, the steel industry or financial industry), it may impact the tax base differently in Wales than elsewhere. In a strange twist of fate, income tax devolution to Wales will happen only four days after the UK leaves the EU. With a ‘no-deal’ Brexit potentially on the horizon, income tax devolution forces us to think of the relative economic effect on Wales, and the consequent impact on the budget. This article was originally published on the Thinking Wales blog. The ‘rest of the UK’ referred to in this blog includes England and Northern Ireland, but excludes Scotland, as the tax base being devolved to Wales is fully devolved to the Scottish Government, and therefore Scottish revenues will not influence the Welsh block grant adjustment. Income tax paid on savings and dividend income will not be devolved to the Welsh Government.